When it comes to handling mail or general correspondence, there seems to be no standard trolley which suits every situation. We have made numerous designs over the years and from these we have developed our standard model which incorporates the features most commonly requested in the custom made designs. Details of this trolley are shown below. In addition, other designs for handling files and correspondence are shown. Methods of handling mail are almost as varied as the mail itself, but the most common situation seems to be to have sorted mail being delivered to departments as well as unsorted mail being collected for redistribution or posting. The standard design trolley is built around this concept. 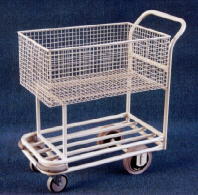 The dimensions are basically the same as the standard TX/041 wire basket trolley shown on the previous page. The basket construction is from 25x25x3mm wire mesh on a steel tube frame which is then powder coated. We use this because it is light and strong and is not noisy like many sheet metal box type constructions. The front corners are fitted with rubber buffers to protect walls, doors and fixtures. The base is constructed with an edge to the shelf. This shelf can be used to carry parcels or to hold plastic crates for unsorted mail to be collected during the delivery round. The standard trolley has two swivel 125mm castors at the front and two fixed 200mm wheels at the rear. This gives excellent handling and stability especially if it is to be taken outside or over uneven surfaces. The crates are supplied as an optional extra and two fit comfortably on the base. There are two depths available, the approximate internal dimensions being 290mm x 390mm x 190mm or 115mm deep. Lids are also available. The trolley can be supplied with a suspension file system manufactured from a tough reinforced vinyl material or a frame can be fitted inside the basket to allow it to hold standard suspension files. Shown here are some basic designs which we have made in the past. If the standard design is not suitable, these may give you ideas that could be incorporated in your mail trolley design. Shown here are the accessories that can be supplied in conjunction with your mail trolley to meet your individual requirements. These are listed in the table below to assist in selecting the product. 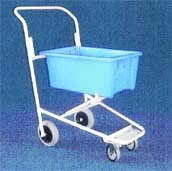 The Nesting Tub Trolley is designed to take a Number 10 or Number 15 Nally Crate (Tub). It is fitted with 200mm fixed rear wheels and 125mm swivel castors to the front. This gives them excellent handling abilities in most conditions. The rear mounting bracket can be set in position to either crate as required. The trolley frames can be nested together to save space when the crate is removed. The crates are of a design that allows them to be stacked of nested as required. Lids are also available for the crates to protect or secure the contents.